Completely transform or enhance the overall appearance of the exterior of your building with an aluminum curtain wall system. Curtain walls are non-structural outer walls designed to provide gorgeous views, natural daylight, and beautiful architecture for your building. 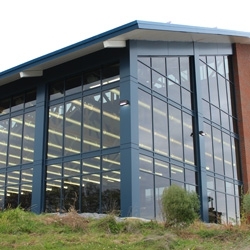 Flower City Glass has the experience and know-how to install quality curtain wall structures that are designed to resist air, water, and wind infiltration. Whether it's for the entire face of your builidng or just a portion, call Flower City Glass today to get started.